The Heil Headsets are supplied to assist with the possible noisy environment at the RACES operator station. The Headset Headphones are stereo and you may place different audio sources in each ear. The D700 has two mono speaker/headphone outputs and these can be controlled by a menu item. See the D700 manual. In the above diagram both right and left band outputs are sent to the Speaker Box. On the back of the Speaker Box is a switch to turn on or off the speaker. You will always hear both right and left channels in the speaker. On the front of the Speaker Box are three headphone jacks. If connected to the middle jack the headphones will output the right channel in the right earphone and left in the left earphone. The operator may listen to both channels and easily tell which channel is calling. Make sure the correct channel is selected when responding by pressing the appropriate knob on the right side of the D700 control head before keying the mic! If the headphone jack is plugged into the left jack both earphones will output the left D700 channel. When in the right the right channel will be heard. The opposite channel is not heard! The Headphones may be used alone without using the boom mic. Simply continue to use the hand-held microphone. 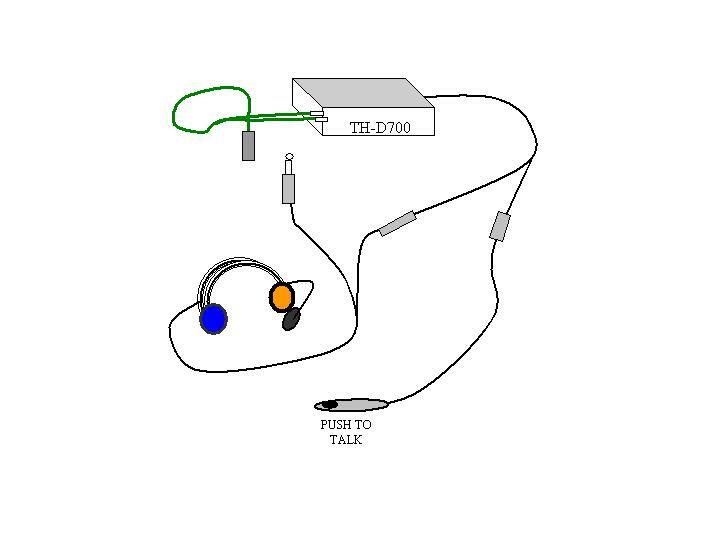 If the operator wants to use the boom-mic on the headset then the adapter connector needs to be plugged into the D700 control head and the push-to-talk switch (PTT) and microphone are connected as shown above. The Headset Headphones are stereo and you may place different audio sources in each ear. The D700 has two mono speaker/headphone outputs and these can be controlled by a menu item. See the D700 manual. In the above diagram both right and left band outputs are sent to an adaptor cable which combines the two mono inputs into a 1/4 inch stereo headphone plug. The Speaker box is not used. If connected as shown above the headphones will output the right channel in the right earphone and left in the left earphone. The operator may listen to both channels and easily tell which channel is calling. Make sure the correct channel is selected when responding by pressing the appropriate knob on the right side of the D700 control head before keying the mic! The Headset Headphones are stereo and you may place different audio sources in each ear. The Alinco has online one mono audio output. 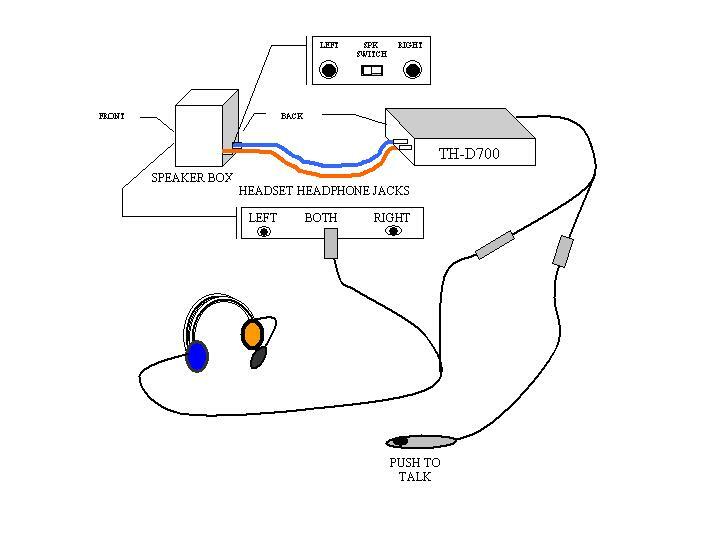 In the above diagram the output is sent to an adapter cable which combines the two mono inputs into a 1/4 inch stereo headphone plug. This channel will be heard on only one ear. The Speaker box could be used with one input as in figure 2 above. In the diagram above it is not used. It is possible to connect one audio output from the D700 and one from the Alinco using the cables and Speaker Box. 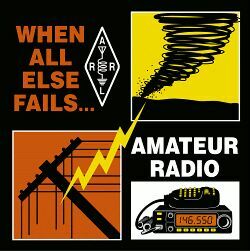 This may be useful when short of staff or running the Packet Station and monitoring a voice channel. The operator may listen to both channels and easily tell which channel is calling. Make sure the correct channel or radio is selected when responding before keying the mic! The Headphones may be used alone without using the boom mic. Simply continue to use the hand-held microphone. 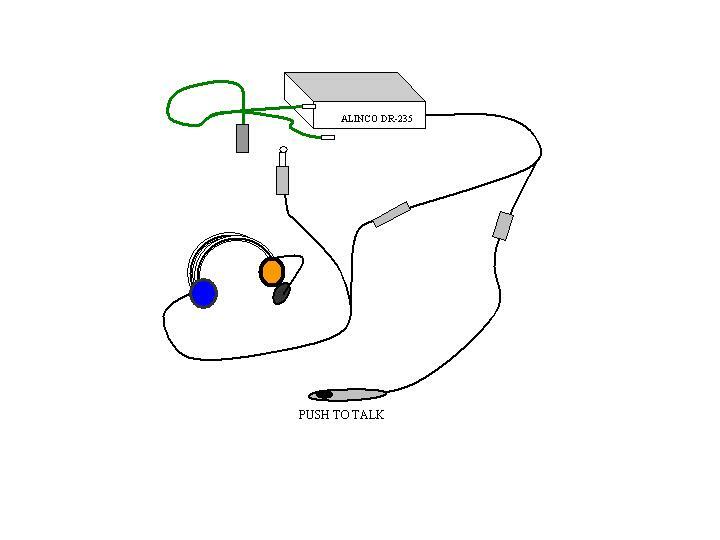 If the operator wants to use the boom-mic on the headset then the adapter connector needs to be plugged into the front of the Alinco microphone connector and the push-to-talk switch (PTT) and microphone are connected as shown above.